As I mentioned in a recent post, I use woolen dryer balls in our laundry. 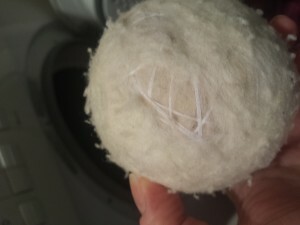 Woolen dryer balls are a natural alternative to fabric softener. Just as they sound, they’re balls of felted wool that you put in the dryer with your clothes. 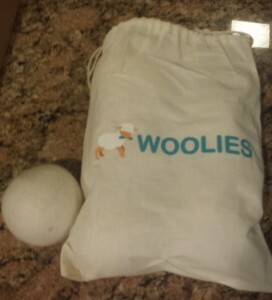 Woolen dryer balls can be scented with essential oils or used on their own. They tend to work quite well to soften the clothes, and it’s said that they also help reduce drying time by separating the clothes as they’re tossing around in the dryer. 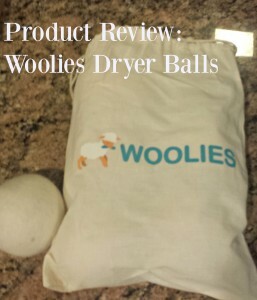 This is a product review for Woolies Woolen Dryer Balls. I hang most of our laundry to dry. I find that doing so keeps the clothes looking newer longer. But towels, socks, pajamas, sweatpants, and sheets all go into the dryer, and these are all things that I want to be soft. They’re not looking too good at this point. 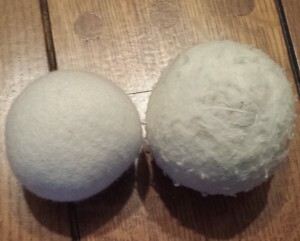 Look how nice and new the Woolies dryer ball is compared to my old one! You can’t even tell! I admit, my camera is horrible, but…you can’t even tell! The one on the right is the one I’ve been using. The one on the left is the new one. I have a good feeling that the Woolies are going to last longer than the ones I had before. They just seem like they’re made better on the outset. I have always used just 3 dryer balls for all loads of laundry and never wished I had more, but some people recommend using 4 for normal loads, 6 for large loads. I like my towels and sheets to smell nice, too, so sometimes I add a few drops of essential oils of my choice on my dryer balls to add a little scent to the items in the dryer. Having six dryer balls means I can have one set with one kind of scent and another with another kind of scent for different items, if I want. The woolen dryer balls also help quite a bit with static electricity, which is awesome. 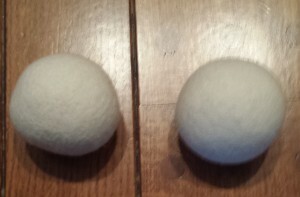 We usually have a big problem with static cling, but not since I started using the dryer balls. Yay! 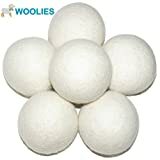 Verdict on Woolies Woolen Dryer Balls: Thumbs up! Highly recommend.